If you’ve ever been on a house hunt you know that those descriptions that Realtors use say one thing but can mean entirely another. It may not seem funny at the time, but later it can seem rather hilarious. Forewarned is forearmed, so knowing about them can save you time and money. Here is a fun list!!! This home is a total money pit! Because they are the size of a shoe box! Obviously not all Realtors subscribe to those descriptions, but it happens! 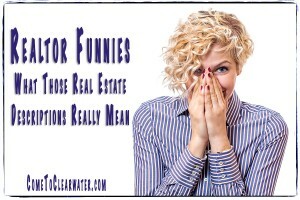 Just remember when house hunting to keep your sense of humor and you’ll be fine!